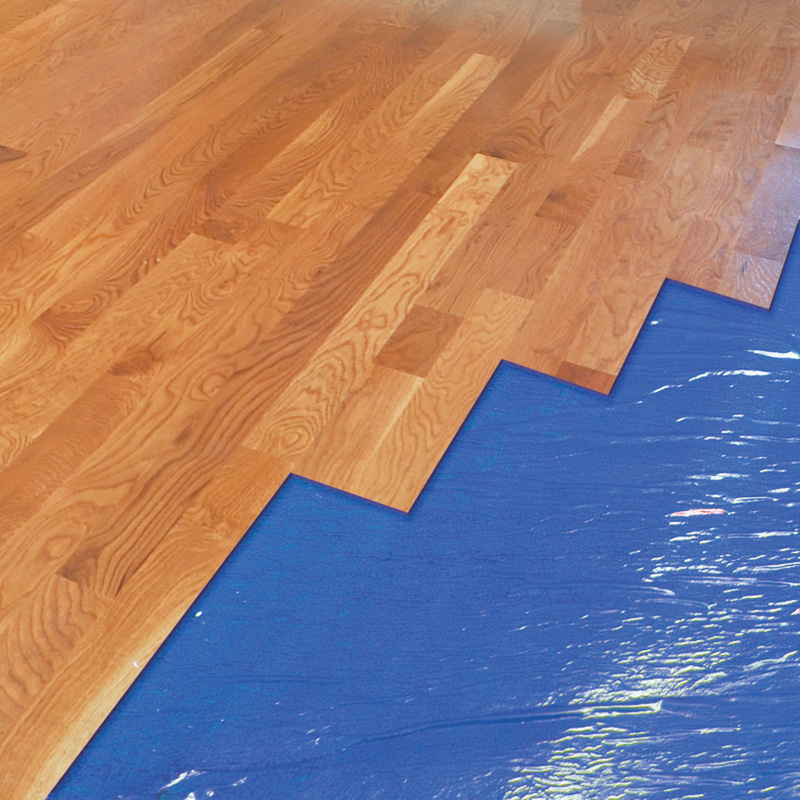 Roberts MoistureBarricade is a 6 mil polyethylene film for laminate and engineered wood flooring. Protects against moisture when used with any standard foam underlayment or laminate flooring with pre-attached underlayment. Roberts Silicon Vapor Shield is a moisture barrier underlayment made of 6 mil. wet strength paper with a backed silicone coating that will not allow moisture to penetrate through to the wood flooring planks. 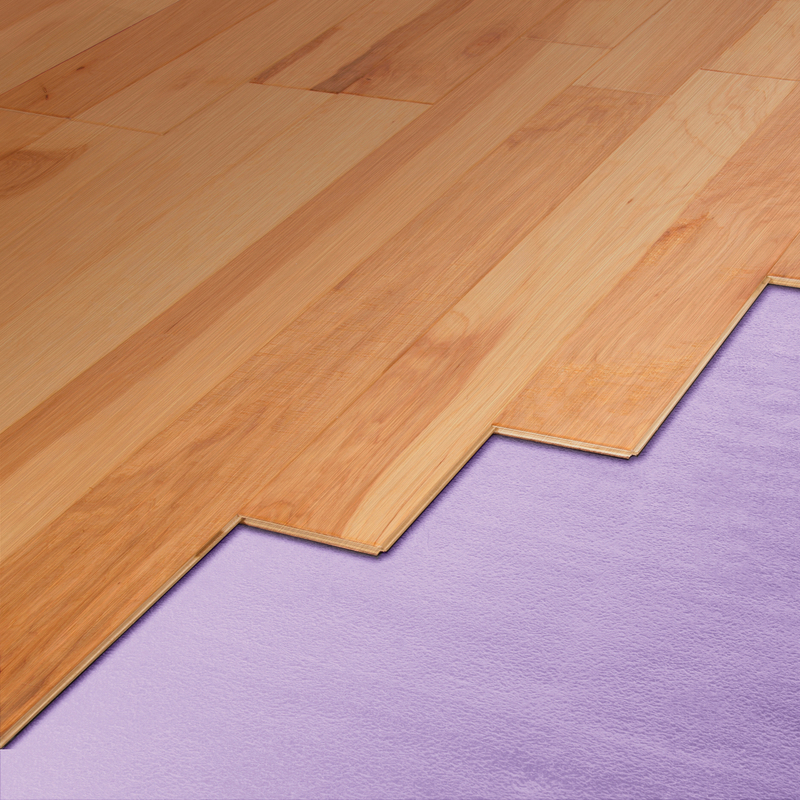 Since SVS is made with silicone, the smooth surface allows installers to slide wood planks easily during installation plus it does not contain any toxic tar or tar-based ingredients found in some underlayments. The SVS is a white paper that allows a more visible chalk line and doesn't leave a black residue on hands or walls and will not fall apart during installation like red rosin, Kraft paper or wax papers do. 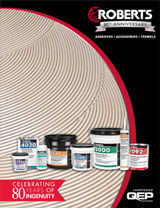 Roberts Underlayment Seam Tape is perfect for foam underlayment under floating floors, carpet padding and more! This versatile, "Easy Tear" tape provides an essential moisture resistant seal, necessary even for underlayment with attached lip and tape. Underlayment Seam Tape is also great packing and general repairs. Roberts First Step creates a pocket of constantly circulating air which inhibits mold growth. Black Jack Floating Floor Cushion Underlayment is a dense foam underlayment that helps absorb everyday in room noise under laminate and engineered flooring. The closed cell foam design is moisture resistant and fights against mold and mildew. Quiet Cushion is a premium acoustical underlayment made up of sound dampening high-performance cross-linked foam with an overlapping film for extra moisture protection at the joints. The extra fine foam offers advanced moisture protection and shock absorption. Utilizing this Progressive Foam Technology (PFT), Quiet Cushion is designed for supreme sound reduction, with a Delta rating of 21, one of the highest in the industry. Roberts Serenity Underlayment is an ideal solution for above grade installations of laminate and engineered wood flooring over wood subfloors. It can also be used over concrete slabs with Roberts 70-115 MoistureBarricade. This product levels minor subfloor imperfections and also provides cushioning. Roberts Soft Stride is a dense, closed cell foam underlayment that provides excellent sound reduction under laminate and engineered flooring. It also protects against moisture and fights against mold and mildew. 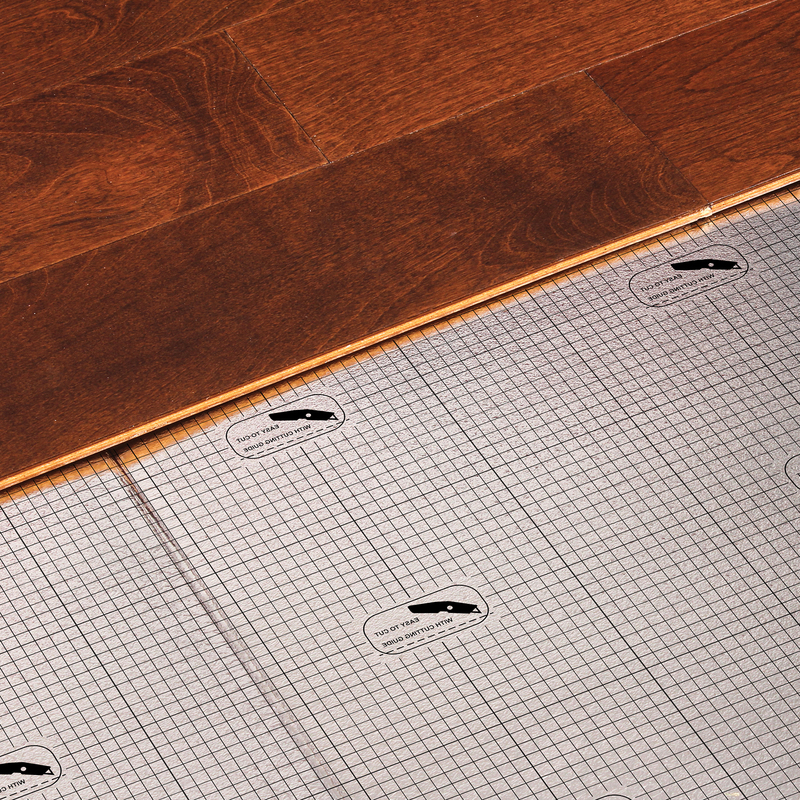 The 3" helps seal out moisture and easily attaches to the included adhesive strip. The new ROBERTS SoundBarricade is a universal sound control underlayment that provides superior acoustical properties under Luxury Vinyl Tiles & Planks, Laminate, and Engineered Wood & Hardwood Flooring. SoundBarricade's unique high density, rubber blend retains its shape and cushioning to maintain the integrity of the flooring and improves the room acoustics. Thermawave’s unique folding design eliminates corner curling and re-rolling, allowing for easier, faster installation. 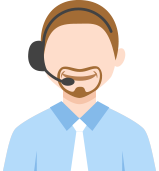 Its aluminum backing provides moisture protection and thermal insulation, while its dense 2mm foam provides excellent sound reduction. Ideal for the floating installation of laminate, engineered and click lock bamboo flooring. 3-in-1 Silent Warmth Fan Fold Underlayment is a premium 2 mm fan fold underlayment used for Laminate and Engineered Wood flooring. Made from recycled materials, this underlayment provides premium cushioning and thermal insulation. The folded design is lightweight and easy to install with a lip and tape connecting system. 4-in-1 Silent Warmth Ultra Fan Fold Underlayment is a premium 3 mm fan fold underlayment used for Laminate and Engineered Wood flooring. Made from recycled materials, this underlayment provides premium cushioning and thermal insulation. The folded design is lightweight and easy to install with a lip and tape connecting system. Roberts Underlayment and your laminate floor, the perfect Unison. In the growing market of laminate and engineered hardwood floating floors, the biggest concerns are noise/sound and water/mold damage. Roberts Unison 2-in-1 is engineered to meet the highest standards in sound reduction, moisture protection and comfort, and even minor sub-floor corrections. 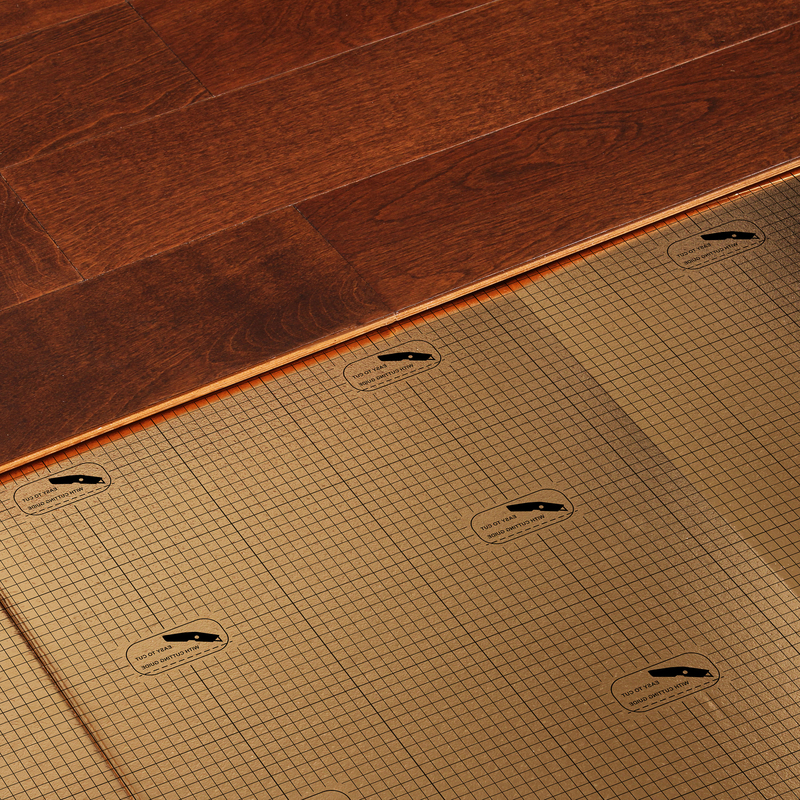 Cork Pro Plus is a premium underlayment designed to reduce impact noise transmission and provide extreme resistance to residual indentation. It improves walking comfort, is non-absorbent, resistant to mold and mildew and levels and minor subfloor imperfections. Made from rapidly renewing and recycled cork with recycled EVA foam. Ideal for double bond flooring applications in conjunction with Roberts 6300 Pressure Sensitive Adhesive. Roberts Natural Cork Sheets reduce sound transmission from both the surface of a floor as well as through the floor to living spaces below. 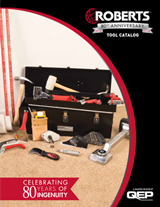 ROBERTS Airguard is perfect for all floating laminate and engineered wood installations. Airguard is the only underlayment manufactured with both Microban® and Air Flow Technology: Microban® inhibits the growth of odor and stain causing bacteria, mold and mildew and the Air Flow Technology creates a pocket of constantly circulating air to further inhibit mold growth. Sound suppression characteristics make Airguard perfect for installation in multi-level buildings.